Essay writing in high school provides a solid basis for homeschoolers in critical thinking, research writing, persuasive speech and so much more! Homeschooling high schoolers must have great essay-writing skills. They need to be able to comfortably crank out essays to be prepared for college (and college entrance). 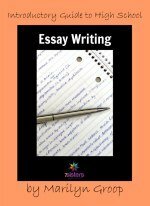 Introductory Guide to High School Essay Writing, by Marilyn Groop, is a 10-week, 61-page downloadable e-curriculum to help your inexperienced writer learn the fundamentals of writing a cohesive essay. Presented in a user-friendly format, this guide is designed for independent learning or for use in learning co-ops. Packed with practical information, it includes NO busywork. While built on the skills learned in the Middle School Essay Writing Guide, it is not necessary to have worked on that guide in order have success in this course. Give your homeschooling high schooler the essay writing skills he/she needs with this important guide. Click here to view an excerpt from Introductory Guide to High School Essay Writing. What are homeschool parents saying about 7Sisters Writing Curriculum? “The language arts writing program has helped our two reluctant writers succeed in their writing. The intermediate essay writing curriculum broke down the steps so that even my student who has never felt successful in writing, and avoids it at all cost, was able to write several papers without the panic that he used to experience. It worked well for our “writer” as well. He felt that it was challenging enough that he could grow in his writing skills without being repetitive or boring. Our daughter said that “I finally can write without fear.” They are now able to write high school level papers in all of their courses. They all said that they do not want to use any other writing curriculum ever again! Research writing, here we come!” – Adell C.
My daughter is a graduating senior who is dyslexic and dysgraphic so she finds essays very intimidating. We have struggled to find the balance between instruction that will prepare her for college and instruction that meets her where her ability level is. We have found your high school essay writing guide fits the bill for her. The assignments are broken down into easy to understand pieces and we can go as slowly or as quickly as she feels comfortable with. Also the fact that it is mostly independent work for her makes her happy because she wants less and less “mom input.” – Amber V.
Essay Writing in High School. See if curriculum from 7Sisters’ veteran homeschool moms can make a positive difference in your homeschool.